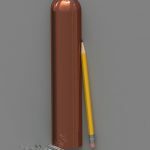 Deep Draw Copper Electrodes – Quick Draw Machining, Inc.
costly (approximately eight times that of low carbon steel) the avoidance of waste becomes even more crucial to the operation. Benefits of Deep Drawing Copper: The best way to efficiently avoid scrap is through the process of deep drawing. When compared to machining, deep drawing only uses the net amount of material necessary to form a part, whereas machining will use more, at a higher cost, to achieve the same end result. over the life of a project.